If you’re a vegetarian, you have a major win coming your way: After years of research, a team of scientists at MIT has finally developed a way to turn ordinary beef into lettuce. Hear that? That’s the sound of vegetarians everywhere applauding this incredible development. 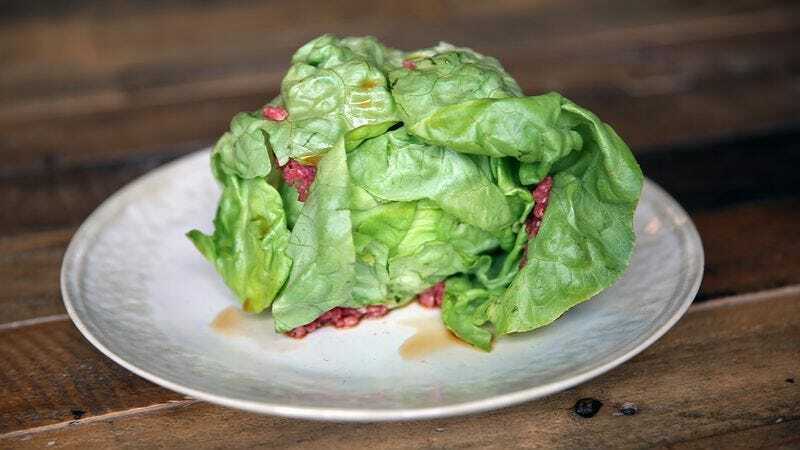 The brainchild of a group of vegetarian MIT grad students, the lettuce is made using an ingenious technology that converts cow meat into a fibrous, cellulose-rich product with all the nutrition and taste of the real vegetable. At the conversion rate of two cows to produce one lab-cultured head of lettuce, this is sure to be a game changer for leaf lovers everywhere. Worried that it will taste weird? Don’t be. The reviews from the initial blind taste tests are overwhelmingly positive. Aside from a slightly pink hue, the lab-grown lettuce is virtually indistinguishable from the real thing. And tests are already underway to use chicken meat to help clear up those pink impurities in the lettuce. Right now production costs for one cow-constituted head of lettuce are upwards of $100,000, but as the process for turning cows into lettuce becomes quicker, it’s inevitable that the price will lower dramatically. Within 10 years, your local grocery store may be chock full of beef lettuce, and that’s something vegetarians everywhere can all celebrate. With climate change becoming more and more of a prominent issue, it’s comforting to know that as long as we have access to massive quantities of beef, we will be able to turn it into lettuce and enjoy salads far into the future. Science FTW! It’s probably safe to say that we’re going to see a major uptick in vegetarianism soon!